Udinese football club fan Arrigo Brovedani has stolen media attention in Italy after being the only supporter to show up to watch his club play an away game in the top league. Arrigo Brovedani was the club’s sole supporter in Genoa for a Serie A match against local team Sampdoria. The 30-something wine merchant found himself alone in the visitors’ section. 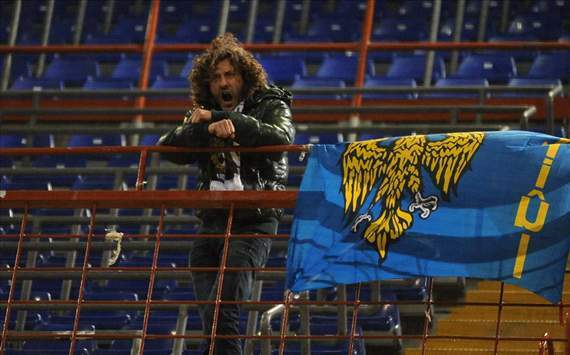 But Sampdoria stewards gave him coffee and home fans invited him for a drink after the match. Arrigo Brovedani said he had not expected to find many fellow supporters from Udinese, one of the smaller clubs in Serie A. It was a cold Monday night and Udinese never attracts more than 50 or 60 away fans. “But I went there thinking I’d find five or six other people,” the Udinese fan said. “I went into the stadium while they [Udinese] were warming up. I shouted and said <<hi>> to the team. Genoa is about four hours’ drive from Friuli, where Udinese are based. But Arrigo Brovedani was in Genoa on business. “I like the stadium there, it’s very similar to English stadiums,” he said. Luckily for Arrigo Brovedani, Udinese won the match 2-0 and the team dedicated their victory to their only fan. He has been invited to attend its next home match on Saturday.